Thanksgiving is only a few days away, and we are ridiculously excited! We’re thankful we have our menus set for the holiday, and now we have beautiful table settings to share, to complete your Thanksgiving meal. 1. An organic look is easy to achieve, with autumn floral arrangements, and in-season pumpkins. 2. Even if you don’t have formal (or even matching) dinnerware, this fall tablescape is totally achievable! No muss, no fuss, and we love the punchy hues of the flowers. 3. Let your meal inspire your table, and use five simple grocery-store items to create this 5-minute centerpiece. 4. Air plants and succulents and gold flatware, oh my! For the hostess who’s always on trend. 5. Sparkling gold place settings with DIY plates usher in the holiday season. Metallic is still an ‘it’ finish! 6. Rustic in the best sense (read: not kitschy or outdated), this beautiful table is quintessentially Thanksgiving. We hope these gorgeous setups inspire your Thanksgiving table. 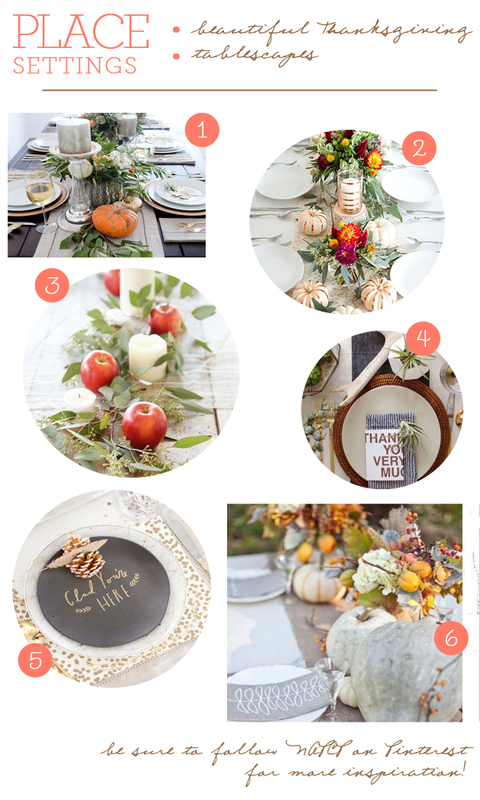 Follow NAPCP on Pinterest for more Thanksgiving inspiration!